Lean Unit 7: Problem-solving Principles and Tools is a half-day, instructor-led course. The course assumes that participants have a working knowledge of Lean Construction theories, definitions, principles and ideas. 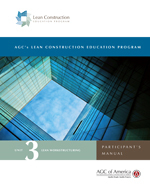 Lean Construction 101 Video, is a recommended prerequisite to taking this course, as are Unit 1: Variation in Production Systems, Unit 2: Pull in Production, Unit 3: Lean Work structuring, Unit 4: The Last Planner® System, Unit 5: Lean Supply Chain and Assembly and Unit 6: Lean Design and Pre-construction.